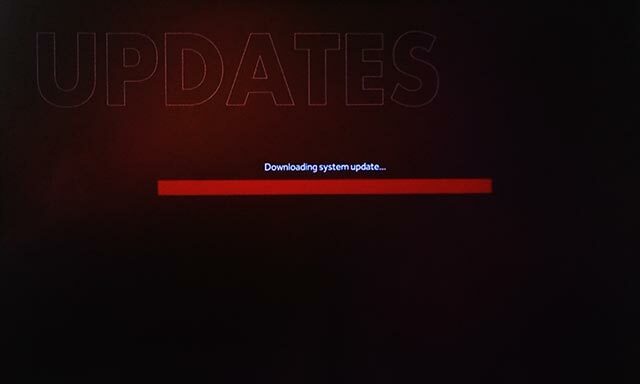 The update boot loop is a fairly common problem with Ouya’s when Ouya Inc used to push updates to these units and either the unit was rooted or the download from Ouya Inc got corrupted for whatever reasons. If you are comfortable the debug mod of android you can follow these steps to go into the Ouya Bootloader and clear out everything and then reset the unit to factory default. However if you want to finally break the loop and restore your factory defaults on your Ouya and then set it up as if it were the first time with your Ouya. You can go into your router and turn off your wireless adapter so that the Ouya cannot get out to the net and check for updates. After your Ouya reboots after failing to update one more time it will place you into Ouyas main menu where you can perform a factory reset under MANAGE > SYSTEM > FACTORY RESET. Turn back on your internet connection and you can re-register your Ouya! It’s annoying that you have to do this and you will loose save-game data. But at least then you can update your Ouya normally and resume game playing operation. As for the reason WHY it boot loops during an update. There is a lot of speculation dealing with the Ouya getting permission to re-write parts of the OS but it can’t. So it simply shuts down and tries again.